These are the towering mountains of the Sangre de Cristo (Spanish for “Blood of Christ”) the southernmost subrange of the Rocky Mountains. What is interesting about this image is that the clouds above the mountains are mirroring the shape of the mountains but in the sky! This imaged is called “Mountains In The Sky”. This range runs from Poncha Pass in South-Central Colorado, trending southeast and south, and ends at the Glorieta Pass, just southeast of Santa Fe, New Mexico. This range used to be called “La Sierra Nevada”, “La Sierra Madre”, “La Sierra”, and “The Snowies” (used by English speakers). In 1719 the Spanish explorer Antonio Valverde y Cosio named the range Sangre de Cristo (“Blood of Christ”) mountains after being impressed by the reddish hue of the snowy peaks at sunrise, alpenglow. On the right side of this image is Mount Herald with its 13340 ft / 4066 m peak. 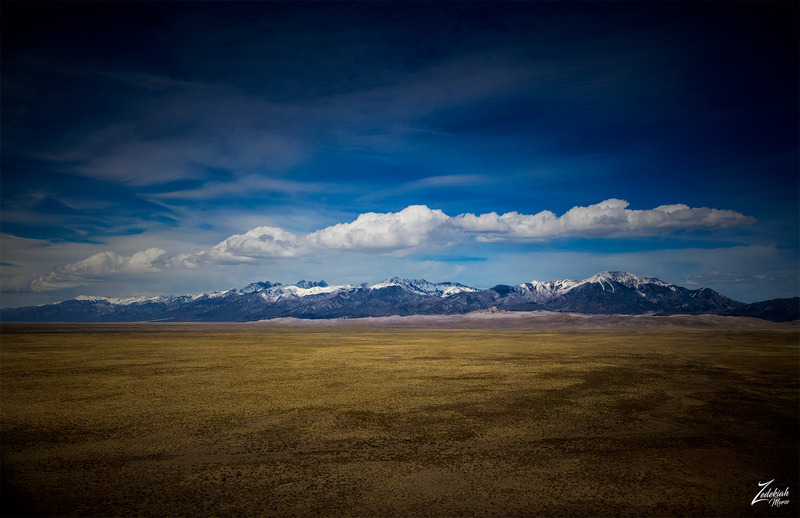 Below this is the Great Sand Dunes National Park, containing the tallest sand dunes in North America which rise to a maximum height of 750 feet / 229 m, from the floor of the San Luis Valley on the western base of the Sangre de Cristo Range. The dunes cover an area of about 19,000 acres / 7,700 ha. Researchers say that the dunes started forming less than 440,000 years ago and were created from sand and soil deposits of the Rio Grande and its tributaries, flowing through the San Luis Valley. Over the ages, the glaciers that fed the river and vast lake that existed across the valley melted away, and the water evaporated. Westerly winds picked up the exposed remaining sand particles from the dry lake and river floodplain. 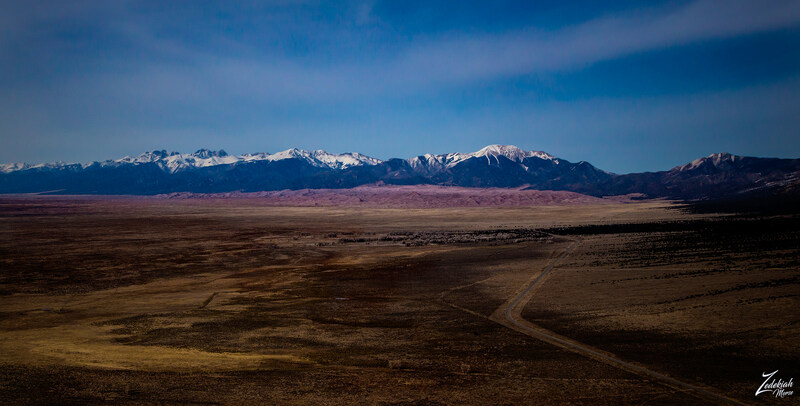 As the wind eventually lost power prior to crossing the Sangre de Cristo Range, the sand was deposited on the east edge of the valley, creating the piled up dunes we see today. This process still continues, and the dunes are slowly growing. The wind changes the shape of the dunes daily as it continues to move sand from the middle of the valley northward. Behind the dunes there is a small creek that runs through that pass to the left of Mount Herald, this is called Sand Creek. In the pass there is a small but pointed peak sticking up in the distance right below the clouds on the horizon, that is Blueberry Peak. Following the ridgeline and continuing up to the left is Cleveland Peak 13,420 ft / 4091 m. Immediately to the left of that is Tijeras Peak at 13604 ft / 4146 m. This is followed by Music Mountain at 13380 ft / 4078 m and then Pico Asilado at 13611 ft / 4148 m. Further to the left is Broken Hand Peak at 13573 ft / 4137 m.
Moving on to the left along the mountain tops we next come to venerable Crestones, a cluster of high summits in the Sangre de Cristo Range, here we have Humboldt Peak at 14064 ft / 4287 m, and then Crestone Needle at 14197 ft / 4327 m and Crestone Peak at 14294 ft / 4357 m.And to the far left we have Columbia Point at 13980 ft / 4261 m, then Kit Carson Mountain at 14165 ft / 4317 m. This was named after the famed pioneer and explorer Kit Carson. And finally the last large mountain on the far left of this image is Challenger Point at 14081 ft / 4291 m. The summit is on the northwest shoulder of Kit Carson Mountain and is a subpeak of the latter. It was renamed in memory of the seven astronauts who died when the Space Shuttle Challenger disintegrated shortly after liftoff on January 28, 1986.